NAPX: Let’s get started. A love for gaming is the one thing that everyone in the NBA 2K community has in common. What were some of the games that developed your love for gaming, and why? Flee: My love for gaming all started when I was just four years old. My first system I ever had was the Nintendo 64, and the games I enjoyed playing the most were Mario Kart and Mario Party. Those were the two games that I loved playing, against my friends and family. That is when my love for gaming and competitiveness first started as well. I always wanted to be one of the best at what I liked doing, in gaming and in life. Growing up as a kid I used gaming as an escape from my personal problems. I deal with anxiety and depression, and I was diagnosed with ADHD and Autism around the age of five. I am someone who grew up very insecure especially with my conditions and my social life is not the best. My family were the only ones who have been there for me from the beginning. I have always stuck to gaming, because it is my comfort zone and it is something I know I’m good at. It is hard dealing with depression and anxiety but one thing I’ve learned is to be yourself and do what you love doing. NAPX: And your competitive nature brought you to the NBA 2K Pro-Am community. How did you get here? How did you and your teammates meet? Flee: When I first joined the the Pro-Am community, I was not recognized at all. In NBA 2K16 and NBA 2K17, I saw these top teams play on stream, like Island Gang, GFG, Space Jam, Still Trill, Slight Work and others. I always knew I was capable of playing on that stage, and I wanted to compete in the Road to the Finals Pro-Am tournament, but I never got to play and show my talent to the community. NBA 2K18 is when I messaged @ImSoFarAhead_, just trying to reach out to the 2K community, and he was the only one who replied to me and gave me an opportunity to show my skill set and how I play. I saw him on GFG’s roster and he was the only one that paid heed to me. So, thanks to him, I am in the position that I am in now on the Pro-Am scene. 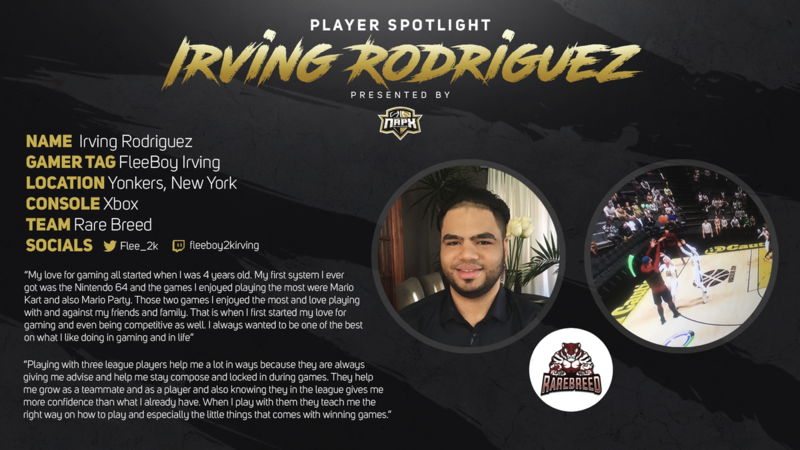 NAPX: How has the opportunity to play with three NBA 2K League players helped you grow as a player? Flee: Playing with three league players helped me in a lot in ways because they are always giving me advice and they help me stay composed and locked in during games. They help me grow as a teammate and as a player. Also, knowing they are in the league gives me more confidence. When I play with them, they teach me the right way to play, especially with the little details that come with winning games. NAPX: Tell me what your play style is. Do you think that a player’s experiences shape how they play the game? Flee: Yeah, experience helps a lot, especially with me. The more you play the more you pay attention to the little details and become more aware of certain situations going on throughout the game. I have become more poised and make better decisions throughout the game especially with my shot selection. I’m a pure sharp so what I do is space the floor for my teammates for them to create. Also, with my current team I work around offball wraps to try to score or make a play and put pressure on my defender at the wing. All with keeping the floor spaced and it helps my point guard have more options on the offensive end of the floor. NAPX: Where do you see yourself next? How do you think your play style can fit into NBA 2K League teams? Flee: Where I see myself next is the NBA2K League. I followed it last season and I enjoyed the energy of the games, people interacting with other players competing on the highest level while the fans are watching them and giving them a great spectating experience. How my playing style fits with any team is being aggressive but also smart. In this game, I feel like you need an aggressive point guard that can put pressure on the defense by creating for themselves and others by being a floor general. I feel like I would fit great as a pure sharp with my point guard looking for me and hitting me in the right spot while I’m taking and hitting smart-effective shots. I can even make smart passes given the opportunity and I will make every possession count. I am very committed on the defensive end on the floor and I communicate with my team and we bring out the best in each other. Most importantly, I’m going to be a great teammate on and off the court and just let the game come to me. I would bring my hard work and dedication to any team and do what I can to win.